LOCKDOWN by Battenfeld Technologies, Inc.
Battenfeld Technologies, Inc. is excited to announce our brand new, extensive line of gun vault accessories ─ LOCKDOWN. With products to control climate, optimize space, increase security, improve visibility and organize contents, LOCKDOWN is the most comprehensive line of vault accessories on the market today. Consumers will appreciate LOCKDOWN as an effective, affordable means of maximizing their vault’s potential. By enhancing organization and improving accessibility, LOCKDOWN makes the storage of valuable possessions much simpler. 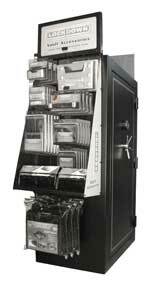 Dealers will love the innovative over-vault merchandising display, which securely hangs on vaults and requires no additional retail floor space. LOCKDOWN offers a number of products to ensure vault space is optimized. Large and small document holders, a key rack, and numerous mesh organizers keep items secure and organized. Each product offers a universal attachment system that allows them to hang from metal or carpeted doors and walls. The LOCKDOWN hanging draw attaches to any vault shelf, offering added storage below. A magnetic barrel rest attaches to the outside of your vault to offer a secure place to rest firearms while collecting additional items from inside your vault. Handgun racks offer an organized storage solution. Get the most out of your vault. Get LOCKDOWN.